Proactively protect your web shop, internet banking platform, mobile app, ICS (SCADA/DCS), IoT device or IT infrastructure via penetration test / ethical hacking, code review, reverse engineering or APT test by our certified penetration testers and security researchers. There is no «typical» penetration test. Therefore, we offer various types of penetration tests / ethical hacking (incl. APT tests), optimized to the specific requirements of web applications, mobile apps, SAP solutions, ICS (SCADA/DCS), IoT devices, different attack vectors and general conditions or your particular needs (e.g. does your SOC, cloud or service provider live up to its promises?). We have one of the largest teams of highly skilled, salaried and certified penetration testers in Switzerland conducting over 200 penetration test projects per year and employ the most current methods and strategies which are also used by «real» hackers. We cover the entire range from standard penetration tests, code reviews, exploit development, reverse engineering to ethical hacking and APT tests under real-life conditions. The penetration test is a realistic, simulated hacker attack. During the available testing time all security vulnerabilities are systematically searched for. A penetration test involves a much higher degree of manual work than a fully automated scan, with the testers putting themselves in the position of a hacker. In comparison to an application security audit, the penetration test encompasses unprivileged tests (i.e. tests without knowledge of valid access information like user ID/password, etc. ), but privileged tests may be carried out if access information becomes available during the penetration test. The main differences between a penetration test and ethical hacking are that in the former, the testers are looking for all vulnerabilities and the object of investigation may be penetrated but not modified permanently. The application penetration test is a security test of an application and its associated front- and back-end systems. Web applications, mobile apps, appliances as well as classic client/server applications may be examined as executable programs or as source code. During the available testing time all security vulnerabilities are systematically searched for in the operating system, the basic services and the application on top. During this type of penetration test both unprivileged and privileged tests will be carried out, thus covering both the perspective of an outsider (e.g. hacker) and an insider. The application penetration test is the most comprehensive test type, which is especially suited for critical infrastructure like ICS (SCADA systems / DCS), internet banking portals, online shops, mobile apps or interactive business websites. In some cases an application or a system are in scope of a security audit, however, the client does not have access to the source code / blueprint of the device or does not want to reveal these. 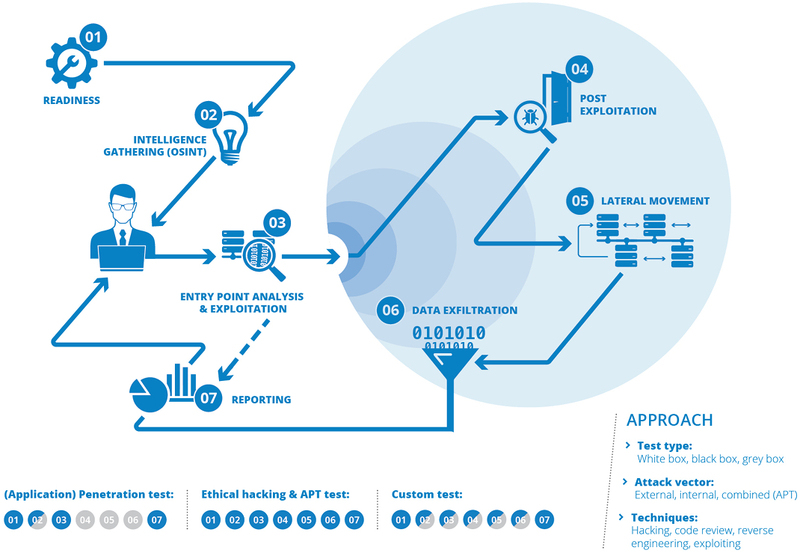 Reverse engineering is the analysis of the security-related system behavior and functionality of a device or an executable application based on the black-box approach. Each of our projects starts with a kick-off meeting to make sure we understand your specific requirements, agree on testing conditions and clarify open points. If required, we will also send you the tool-generated output, action logs and dump files from the penetration tests. For each penetration test type we will make sure that assessing the security vulnerabilities of your system is done in a thorough and cost-effective way. If a large number of systems need to be tested, we recommend taking a funnel approach. Thereby all systems are first analyzed with a security scan, based on the results of which we decide with you which systems should be tested more intensively with an IT infrastructure penetration test or an application penetration test. Since Oneconsult’s inception in 2003, we have conducted over 1200 penetration test projects of various types, 850 of which are OSSTMM-compliant. Amongst other qualifications (like GXPN, OSWP or OPSA), our technical security specialists hold OPST and OSCP certifications. Oneconsult AG is an ISECOM Partner (accredited trainer) and, based on the number of OSSTMM-compliant security audits, Europe’s leading OSSTMM security auditor.